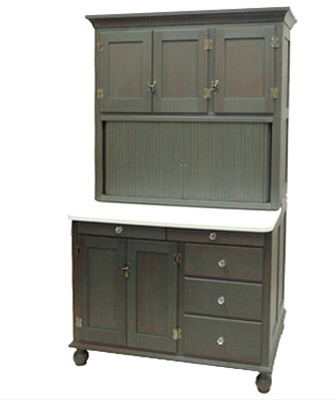 This piece was made for a client who has been using an original Hoosier cabinet for years. The doors wouldn't stay shut, the mixer didn't fit, it was too small for the space.... you get the idea. We found reproduction hardware on the internet and upgraded the work surface to Corian. Works just like the original with the pull out drawers and counter, flour bins and recipe holder.